Rugged front-runner Saint Emilion once again showed his penchant for the Ellerslie track when he led all the way to win the Gr.3 OMF Stakes (2000m) on Tuesday. The Murray Baker and Andrew Forsman-trained seven-year-old made it win number fifteen from 41 career starts, with six of those victories coming at the venue. 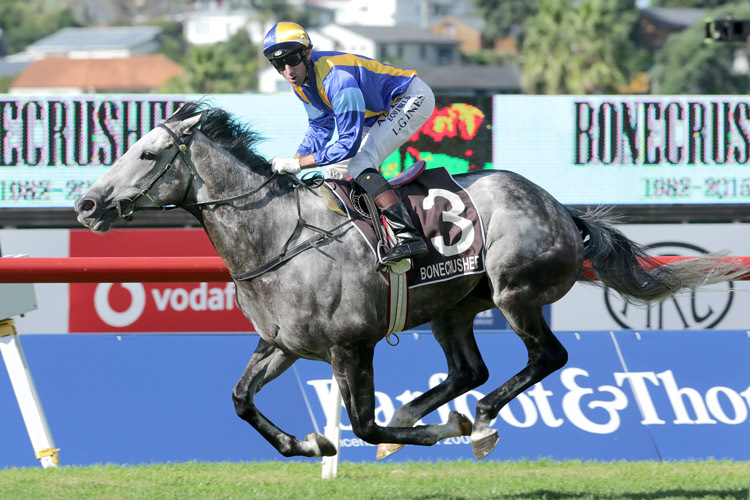 Amongst that Ellerslie winning tally is last season’s Gr.1 New Zealand Stakes (2000m) while it was also his second win in today’s event after taking in out in 2016. The win also represented a major form reversal for the Mastercraftsman gelding who had finished last of thirteen runners in the Gr.1 Livamol Classic (2040m) at his most recent start. “It was a bit of a head-scratcher at Hastings last time as we just couldn’t put a finger on why he went so badly,” Forsman said. “He certainly perked up today and it could be that he was back on a track that he just loves. “It was a very brave effort as he looked beaten at the 0 but he kicked back strongly and was going away again at the post. Forsman was also pleased with the performance of runner-up Lizzie L’Amour who ran on resolutely from the rear of the field. “The track was probably a touch firm for her so I thought it was a good run,” he said. “She does find it hard at this level on the really firm tracks as she gets back and it can be difficult to make up much ground. The win was the second on the day for the powerful Baker-Forsman stable after Rhinestone Cowboy downed a handy field of rating 65 gallopers over 1 m in the previous event.